You’re happy with your home. You like the neighborhood, schools and location. Moving doesn’t seem to make a lot of sense. But as your needs change, perhaps you’re considering a few home renovations to keep pace. Home values are back on the rise, and that means your borrowing power is on the rise as well. Great news! Lake Michigan Credit Union’s Max Equity Plus loan lets you take advantage of that rising equity. All of it. 100%-- not like the 80% or 90% most banks offer. You’ll get a great loan rate, no closing costs and can get your cash in as little 10 business days. In most cases, there’s no appraisal needed! 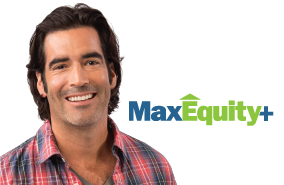 Max Equity Plus is the best way to convert your home’s equity into usable cash for home improvements or debt consolidation. You need to check this out! Call us at (616 or 800) 242-9790, visit any branch or to LMCU.org to find out more. *APR = Annual Percentage Rate. Best rate offered. Subject to credit and collateral approval.